One of the common prayers in the two Writ Petitions filed recently before the Supreme Court of India is to declare that the Advocates shall not be appointed as the Judge in the same High Court where they have practiced or where their blood relatives are practicing. The petitions have been filed by one Anil Kabotra, a retired army official and a registered trust, namely Bhartiya Matdata Sanghatan. They pray for the implementation of the recommendations for judicial reforms in Law Commission of India’s 221st Report and the report of National Commission for Review of Working of Constitution, which was headed by former CJI Justice Venkatachaliah. Reference is also made to a resolution adopted by the Central Government on 25.10.2009 in presence of the CJI, Justices of the Supreme Court and High Courts, Members of the Bar, vowing to take steps to reduce pendency of cases from 15 to 3 years. According to the petitioners, the lack of transparent system to assess the merits of persons selected to be appointed as judges is one of the reasons affecting the efficiency of justice administration. The petitioners also state that appointment of lawyers as judges in their own parent High Courts leads to favouritism and partiality. Transfer policy, which was described by the Constitution Bench in First Judges case as a panacea for allegations of favoritism and conflict of interest, where lawyer is elevated as a Judge of the same High Court and where he has been practiced must be introduced without further delay. It is necessary to end the “Uncle Judge Syndrome” by transferring Judges whose blood relatives are practicing in the very same Court, says the petition filed by Bhartiya Matdata Sanghatan. Hence, they seek for a declaration that declare that the Advocates shall not be appointed as the Judge in the same High Court where they have practiced as an Advocate or where their blood relatives are practicing as an Advocate. 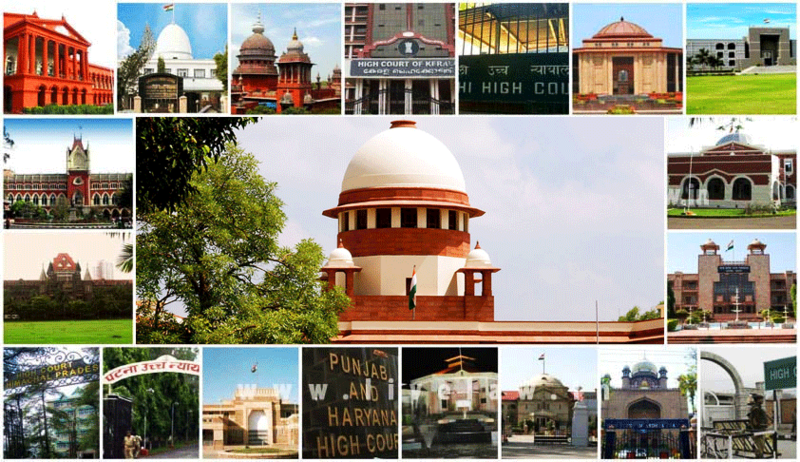 There is a need to increase the number of judges by four fold to reduce the pendency of cases to at least 3 years. Court management should be taken out of the control of the sitting judges and entrusted to trained adjudicators from the judiciary itself or to retired judges who should be made accountable to the task of modernizing, maintaining and showing performance at all levels of judicial establishment. . Judicial time should be devoted to judicial work only. Adjournments are taken on false pretexts, and the law does not have any appropriate method to tackle them. The need of the hour is to have a strict view on adjournments. The use of English as the language of the Courts is affecting access to justice to common men. There is need to reduce pre-trial scrutiny only to verify payment of proper court fees and other objections to be taken up by other side and fix a time limit. Preparation and Service of Summons should be allowed mainly through Advocates. There must be a process of progressive and massive decriminalization of offences now recognized and made culpable as penal offences. They should be treated as merely actionable wrongs for which compensation and not punitive action is the appropriate remedy. The class of compoundable offences under IPC and other laws should be widened. The petitions also bemoan that the time taken for adjudication of commercial disputes in India is too long. It is pointed out that in some countries disposal of a commercial dispute takes only a few weeks- for instance it takes 35 days for adjudication in Singapore, 90 days in Norway and 60 days in Japan.